bada Indonesia: Unduh Aplikasi “AFC 2011 Samsung” Untuk Memenangkan Berbagai Hadiah Menarik! Unduh Aplikasi “AFC 2011 Samsung” Untuk Memenangkan Berbagai Hadiah Menarik! Double the excitement of the 2011 AFC Asian Cup with the Apps4U Event! 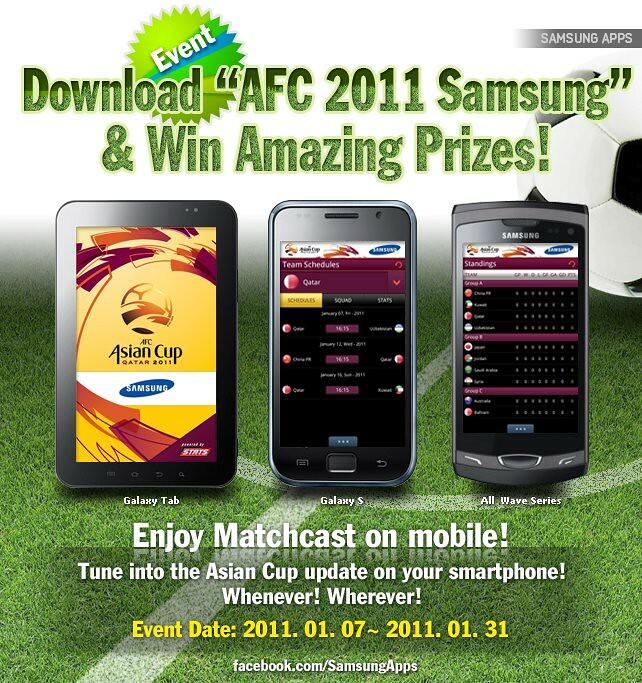 First, download “AFC 2011 Samsung” and get all your Asian Cup information for free! Second, join the “Download AFC 2011 & Win!” event at the Apps4U Event Tab (http://on.fb.me/Apps4UEvent) and simply wait to be one of the winners of the amazing prizes! Download the“AFC 2011 Samsung”and submit your Samsung Apps ID (E-mail address for android users) and country info on the web browser pop-up by clicking the “Click to Join” button to apply to the event on the Apps4U page at http://on.fb.me/Apps4UEvent. 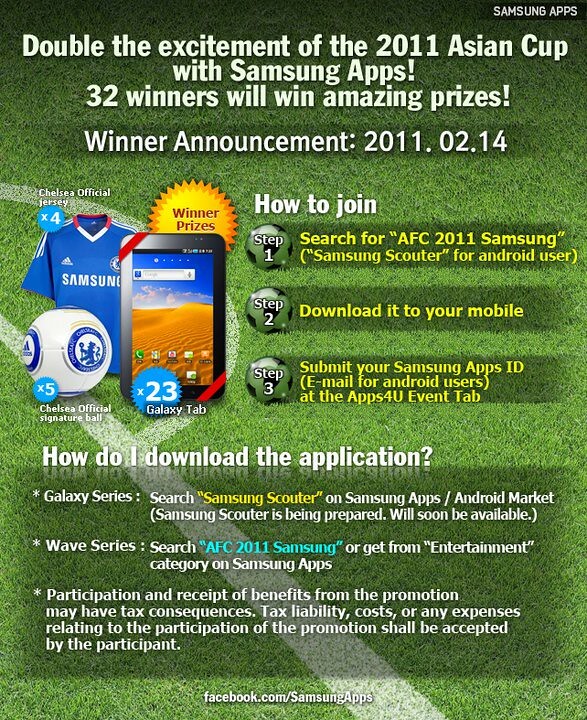 * Participants must download the “AFC 2011 Samsung” selected for this promotion. * To enter this promotion, participants must provide their correct Samsung Apps ID and country information. * Winners will be selected on a random basis. * This promotion is open to all countries. By entering this promotion you (the "participant") agree to be bound by these terms and conditions. Any information or instructions included at http://www.facebook.com/SamsungApps also form part of these terms and conditions. This promotion is in no way sponsored, endorsed, or administered by, or associated with Facebook. The promotion period is from 9:00 a.m. (GMT) on 07/01/2011 to 9:00 a.m. (GMT) on 31/01/2011 ("Promotion Period"). 1. This promotion is open to anyone with a Facebook account who is at least 18 years of age. 2. This promotion is open to all countries. (c) Persons who have breached the terms and conditions of any promotion run by or on behalf of the Promoter. 4. Eligibility is limited to participants who download the applicable mobile application “AFC 2011 Samsung” application. 1. Winners will be notified by e-mail individually within one month of the end of the Promotion Period. The winner will also be announced on the Samsung Apps Facebook fan page (http://www.facebook.com/SamsungApps) on 14 February 2011(TBD). 2. Winners will have 10 days from the date the email notification is sent to them to claim their prize by sending a reply by email (confirming their postal address). 3. In the event that a winner is unreachable, ineligible, or fails to claim the prize in the time required, the winner shall forfeit their prize and it will be awarded to a substitute winner, which shall be the next placed entrant chosen by the panel of judges using the above criteria. 4. The promoter retains the right to delay the timing of the publication of the winner of the promotion. By entering this promotion you agree that your name, Facebook profile picture and Facebook ID may be published as you have submitted them. 1. Other than as set out in these terms and conditions or for the purposes of operating the promotion, the details and information provided by you when entering the promotion or claiming a prize will not be used for any promotional purposes, nor shall they be passed on to any third party. 2. Participants' details and information may be collected during the event, which will be kept strictly confidential. 1. You must have access to the Internet as the promotion can only be entered online. 2. You must have a valid e-mail address. 3. The prize is non-transferable, non-exchangeable for cash, credit, or any other items. 4. The prize will be forfeited if the winner fails to redeem the prize on the designated date for the prize. 6. If for any reason the promotion is not capable of running as planned, including without limitation, infection by computer virus, bugs, tampering, unauthorized intervention, fraud, technical failures, or any other causes which corrupt or affect the administration, security, fairness, integrity or proper conduct of the promotion, the promoter reserves the right, at its sole discretion to cancel, delay, modify, or terminate the promotion without any prior notice. 7. The promoter, its agents, and sub-contractors do not accept any responsibility for any technical failure or malfunction or any other problem with any online networked, system, server, provider or otherwise which may result in any contents or entry into the promotion not being properly recorded or uploaded. 8. The promoter shall not be liable for any disruption to the promotion, whether due to technical problems or otherwise, which is beyond its reasonable control. In the event of any disruption to the promotion, the promoter shall use its reasonable endeavors to remedy the disruption and resume the promotion on a fair and equitable basis to the participants. 9. The decision of the promoter is final and the promoter shall not enter into any correspondence about the results. The promoter accepts no responsibility for entries lost, misdirected, illegible, late, mutilated or altered. Entries that do not comply with these Terms and Conditions will be disqualified. 10. The promoter reserves the right, at its sole discretion, to disqualify any participants deemed to be (a) tampering or attempting to tamper with the entry process or the operation of the promotion or any website of the promoter’s partners; (b) violating these Terms and Conditions; (c) violating the Terms and Conditions of the promoter; or (d) acting with intent to annoy, abuse, threaten, or harass any other person. 12. The promoter reserves the right to amend these Terms and Conditions at any time. All matters and disputes will be subjected to the final decision of the promoter. 13. Participation and receipt of benefits from the promotion may have tax consequences. Should there be any tax liability for participation in the competition or the receipt of a prize, or costs or expenses relating to participation in the competition or for any other reasons, such taxes and/or expenses shall be the sole responsibility of the participant. 14. This promotion is governed by each country’s law.